Losing a loved one is hard enough but then managing the assets of their estate can be an extra challenge. Is an Estate Clean Out or an Estate Sale for a loved one in the Indianapolis area in your future? Lets hope its not but just in case here are some tips to keep in mind. Will the items be divided amongst family members? If so select a date that is convenient for everyone to meet at the property and go over the items to be divided. Can any of the unwanted items be donated? There are several charities located through the greater Indianapolis area who will accept donations of unwanted items such as clothes, furniture and other miscellaneous household items. After family members or other loved ones divide the items they would like to preserve and the unwanted items are donated there is usually another pile of junk that needs to be disposed of. This is where your friends at Bin There Dump That Indianapolis can help out with the removal of the trash, junk or other unwanted items. Depending on the size and amount of items to be disposed we invite you to give us a call to help select the perfect size dumpster to meet your needs. Having specialized in hundreds of Estate Clean Outs the experts at Bin There Dump That –Indianapolis will deliver a clean and green dumpster to get rid of the final items of the Estate Clean Out. Give us a call at 317-590-1973 or send us an email and our family owned and operated business will be more than happy to help you select the perfect size bin! How are dumpsters delivered is a question we are often asked by our valued Indianapolis customers. Believe it or not dumpsters can be delivered in a couple of different ways. Some are trailered to the job site or home while the most popular way is using a truck to place a dumpster. As we all know however there are different size trucks and every dumpster company has their own fleet of vehicles they use to deliver their own particular dumpsters. The majority of companies in the industry will use a larger truck to deliver a dumpster. The larger trucks such as a Kenworth T-800, Mack C713, or Peterbilt 567 are set up as tri-axle trucks and allow for larger and heavier dumpsters. These trucks are equipped to handle from 10-yard to 40-yard dumpsters in size and can hold over 12 tons of waste. The larger trucks not only weigh a lot but also aren't as maneuverable as some of their smaller counterparts. 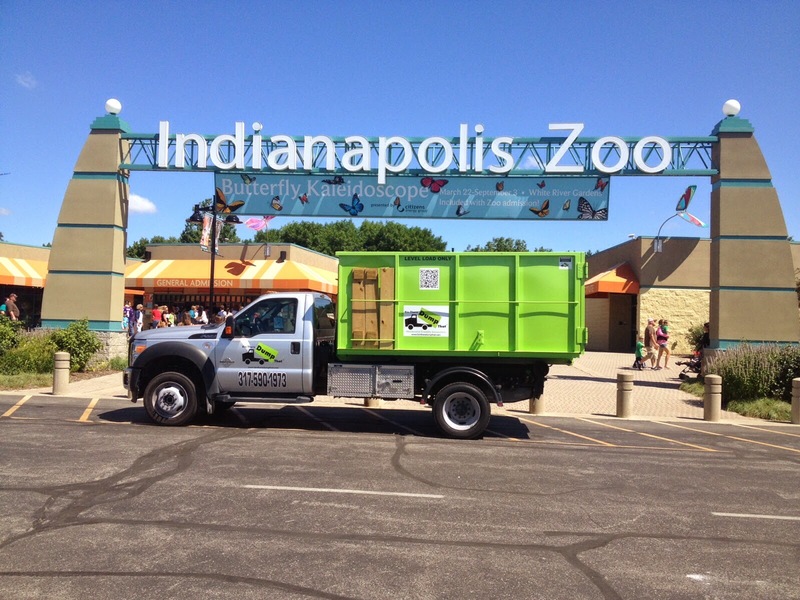 Other companies such as Bin There Dump That Indianapolis use smaller vehicles such as Ford or Dodge pick up trucks. These smaller trucks allow the driver to get into tighter spots and weigh much less than the larger tri-axle kind. The size of dumpster which can be delivered is smaller when utilizing the 550 style trucks. Typically you will see dumpsters ranging in size from 4-yard, 10-yard, 15-yard and 20-yard units delivered using the smaller trucks. Although rare you may also see dumpsters delivered on trailers. These dumpsters vary in size and often are delivered with a dually truck. When choosing a dumpster company be sure to ask questions and see how each company delivers their products. Do you have the clearance on your property for a large truck or would a smaller one be better. Do you need a large dumpster or will a smaller one work, check out our order delivery page to pick the perfect size bin. These questions will determine how the dumpster will be delivered for your particular need. Need to discuss ordering a dumpster? Give us a call at 317-590-1973, we will be more than happy to help you out!